Geena Matuson, Pasteligious Polytrait (process work), 2015. While looking at various graphic design tutorials, I came across a tutorial on 'how to create a low-poly self portrait.' Simply, a low-poly image is a geometric image made up of polygons used for 3D model rendering, but there's more to it than that. First attempt at low-Poly Portrait of Geena Matuson created using Adobe Illustrator, 2015. I soon decided this would be the next step in my creative work. Basically, this tutorial would help me learn how to use Adobe Illustrator and create geometric vector images. A friend also noted that I'm simultaneously teaching myself how to create skins for 3D models - and if I get a 3D model rendering program, I'd see how it works! I used this digital arts online tutorial, along with several Google searches on how to use the 'Live Paint' tool in Illustrator. About 8 hours later (half of which were pretty frustrating), I successfully created my first image in Illustrator. I loved it, but I thought I could be more intricate. If you know my work, you know I love color and pay particular attention to detail. This time, I decided to make individual polygons for each and every single variation in color and tone throughout the entire image. To save time, I skipped the Photoshop tracing portion of the tutorial, and dove right into the pen tool in Illustrator. I went back into Illustrator and I created a more detailed piece. Detail images of process work. Second, detailed attempt at polygon portrait of Geena Matuson created using Adobe Illustrator. Second, detailed attempt at polygon portrait of Geena Matuson created using Adobe Illustrator, 2015. My second time using Illustrator, I completed this piece. 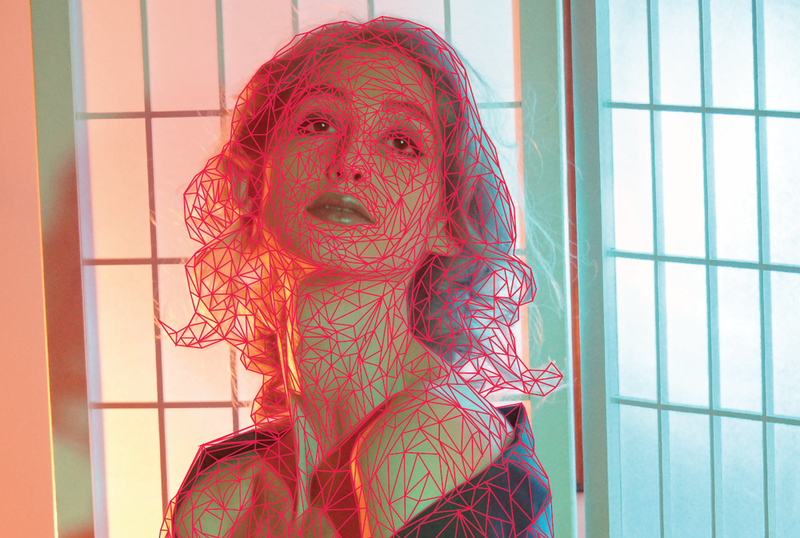 Detailed 'Polygon Self-Portrait of Geena Matuson' created by the artist using Adobe Illustrator, 2015. Another cool thing about this work is the fact that it's a vector image; I can enlarge any area of this image and create 'polygon backgrounds' for people's websites or desktops, as have become so popular. This new work has inspired some concepts and ideas for a new series, including timelapse videos, gif images, and entire scenes. If you have any suggestions about what you'd like to see, I'd love to hear them!